My fall wreath needed a makeover. 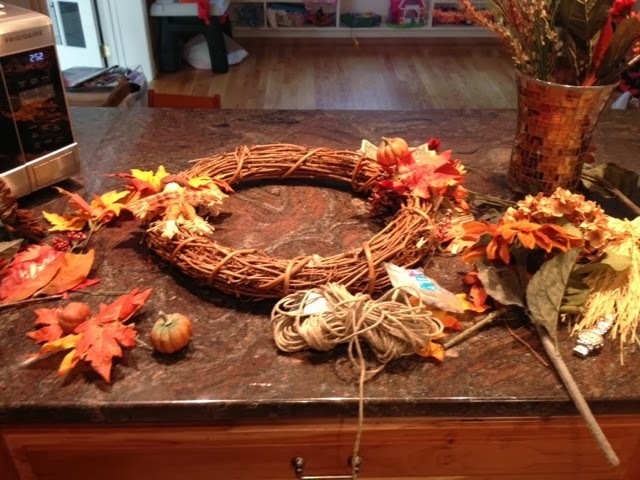 The bones were fine - the grapevine wreath and the colorful fall flowers - but I just wanted something fresh. I recently saw this adorable fall wreath idea that included a mini burlap banner and I instantly loved it. I knew I could easily and quickly make the same thing. I started by taking my original wreath apart. I apologize for not taking any "before" photos in my haste to get started on my new DIY fall wreath. You'll just have to believe me that it wasn't too bad, but it did have more flowers than the updated version. Finally I tied the ends of the jute rope around each side of the wreath hiding the knot behind the flowers and leaves. To make the mini burlap banner I created a powerpoint slide with seven triangle outlines - no fill, black line. (I like to use the outlines so I am sure all the flags are uniform in size.) Then I simply typed one letter inside each flag before printing it on burlap. If you've been following us for awhile you probably know the drill by now; if not here's the 'how to' on printing on burlap using an inkjet printer. Then I simply cut all the little flags out right on the blank outline and used mini clothes pints to attach them to my jute rope. Aren't they darling?